HITOSHI SUZUKI - NEC — What.happens.now? 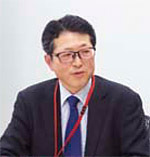 From 2004 through 2012, Hitoshi Suzuki had been the general manager for Corporate Social Responsibility (CSR) Promotion Division at NEC, one of leading Japanese electronics companies headquartered in Tokyo, Japan. He is in charge of the overall management and promotions of Corporate Social Responsibility, including the areas of stakeholder communications, social contributions, and customer satisfaction for NEC group globally. Prior to this position, he was responsible for NEC’s global corporate citizenship programs since 1998. In 2004, he also took up the role as the chief manager for CSR planning and communications for NEC’s multi-stakeholders engagement. Before 1998, he was a corporate marketing director for NEC America, Inc., New York. He was also involved in the business in the Middle East during the 1980s which included a four-year assignment to NEC Cairo Office as a corporate representative. Q: You have been working in the Corporate Social Responsibility (CSR) sector for nearly two decades. Have you seen a change in CSR in Japan and/or the world over that period? What do you see in CSR’s future? I can describe my personal experience at NEC which I think is a good example of how CSR has evolved in many companies over the last several years. These focus points and their evaluation were integrated into the Group’s risk management by 2007. We also expanded the scope of these focus points to take into account our supply chain as well. However, we shared this process with other major ICT companies in Japan who had common supply sourcing and we believed that shared approach would help supply chain companies avoid confusion due to possible too many different kinds of standards and to improve efficiency in implementation of such responsible procurement. So, I then worked on unifying the various standards in our industry in Japan based on our company’s standard in parallel with the EICC standards already initiated by IBM, HP and Dell and others in the United States. After 2006, we gradually focused on social values. We tried to incorporate social expectations to management and business using stakeholder engagement as one of tools. Business should share its responsibility and values with society at large. In 20013, the company decided to build its activities around seven core social themes and four social values: safety, security, efficiency and equality under NEC’s vision to transform the company into a Social Value Creator based on the midterm management plan from 2013 through 2015 (and it is still effective under the current midterm plan from 2016 through 2018). Such decision was made considering the mega trends in technology and society where we foresee very severe sustainability risks around the globe in such areas as environment, economic disparity, safety, congestion, security of energy, food, water, natural resources etc. mainly due to dramatic increase in world population from current 7billion to over 9 billion toward 2050. Following this vision, we have initiated many initiatives trying to solve social issues through innovative business models. You can find many cases on our website and reports such as Vision Book but to give you just two examples: One case is to improve waste management in Santander, Spain using sensors and IoT and the other case is to improve cybersecurity and to reduce cybercrimes in the world working with Interpol. As for what I see as our next step, we need to create the real business cases associated to these initiatives and quantify the value for society, for our stakeholders (including the shareholders). It is very important but at the same time, very challenging. I should also mention the background of such decision to transform the company to a social value creator. Most of Japan’s industry was very competent in creating high quality reliable products. However, today it is difficult to compete with followers with strength such as cheaper labour costs in case of commodities. It is for this reason that NEC withdrew from the B2C personal electronics market and is now focusing on Solutions, in particular solutions to solve social issues. But for this to succeed, we need to figure out new business models in partnership with our clients, our partners, international organisations, academia etc. Q: You mentioned NEC’s change to a Social Value Creator. Do you believe the role of corporations as whole changing? If so how? I believe that in general, Japanese companies have always had a strong sense of purpose, going all the way back to the concept of Sampo Yoshi. Literally "three-way satisfaction", it is a management philosophy which aims to satisfy three stakeholders: satisfaction for the sellers, buyers and the society. This philosophy dates back to the Edo Period. So, there hasn’t been necessarily such a change but more a return towards older wisdom or the basics. In general, a lot of Japanese companies are very hold. Take NEC for example which has always been a telecommunication company. Even so, NEC was created in 1899 as a joint venture with ATT’s Western Electric in America. Kunihiko Iwadare, one of the company’s founders even worked in Edison’s laboratory in the United States before returning to Japan and starting to build the country’s telecommunication infrastructure. Companies should embrace purpose of doing business. It should create values for society and in return it can get revenues as reward to satisfy stakeholders. Q: NEC decided in 2002 to develop a program to support social entrepreneurs. Does the program still exist and if so which trends have you noticed and which topics Japanese social entrepreneurs focus on? The program still exists I am happy to say and I couldn’t really find any particular trends or focus points. Japanese entrepreneurs exist in all sectors of the social economy. At the time I started the program, social entrepreneurship was nearly non-existent in Japan. Today, thankfully, interest has grown and many people, in particular Millennials wish to pursue a career in social entrepreneurship. Before 1998, I worked in NEC America and I saw the difference between non-profit organisations (NPOs) in the United States and Japan. The legal status for NPOs was only introduced in Japanese law in 1998, following the 1995 Kobe earth quake where people saw the importance of having a strong civil sector which helped greatly during the disaster. Compared to Americans, the Japanese do not give much money to NPOs (except maybe during Akai Hane) – we do not have the same culture history and culture regarding tax-exemptions for example – but many people are eager to contribute to social solutions, in particular again younger generations. However, since it is difficult to find funding in Japan, I thought it was important for people wishing to enter the field to have a good level of knowledge in management and operations. After all a non-profit organisation is not a non-revenue organisation, and one needs to know how to manage these aspects so as to make the organisation sustainable. Furthermore, in this program, NEC employees can spend 6 months working pro bono in IT, marketing, accounting, etc. for social entrepreneurs and NPOs. This is because, many employees in NEC also wanted to contribute to social issues and the company wanted to raise their awareness on social needs and issues, as it can help them create business models with social and corporate values. Q: You are the President of the Institute for International Socio-Economic Studies (IISE), which conducts research on information society that should be friendly to humans and the earth. What are your thoughts on the environmental impact of the information age (energy use, extraction of rare metals)? Any idea how to improve the situation? It is not one of the IISE’s focus but I know that NEC’s Research & Development, in partnership with Tokyo and Osaka Universities are trying to design a new AI computer architecture copying to human brain, which uses only 20watts, which is very little energy. Q: What is the IISE’s perspective on A.I.? On automation and its social impact? Funny you should ask. Both these topics will be covered in research projects working with outside partners starting next year. But for automation, I can give you my point of view for what it is worth. Japan is facing a quickly ageing population and will be faced in the future with a real labour shortage issue. For this reason, automation is seen as a good thing here. I am hoping it will solve that issue and then lead to a society with more leisure, where people can dedicate more of their time to social issues. They will still work but fewer hours and in more creative jobs. The type of jobs that computers cannot yet replace. The dark side will be possible reduction in some job opportunities due to AI. People engaged in such jobs will be affected. In this point, it will become important for them to continue to improve their skills and capabilities to create new job opportunities. I guess needs for creative jobs are potentially high and in the hands of humans. Education is so vital. Sustainable Earth, Safer Cities and Public Services, Lifeline infrastructure, Communication, Industry eco-system, Work style and Quality of Life. In partnership with the non-profit organization ETIC. Every year more than 50 candidates apply to join NEC social entrepreneurship school, where they are provided with funding and resources, and where they can receive technical support from NEC employees. NEC had two major reasons for developing the program: employees also wanted to have a direct social contribution, and the company needed social entrepreneurs to source new business ideas directly connected from community needs. Community Chest in Japan, also known as the Red Feather, is one of Japan’s largest non-profits. The Community Chest has historically been seen as a leader in solving social issues. By working directly with local residents, the Community Chest forms strategies that are in line with their specific needs.